Effortlessly Research & Monitor Domains with Our Latest Web-based tool! Over the years our constant endeavor has been to provide domain related useful information as accurately, simply and quickly as possible. With the largest database of domain Whois records collected over a decade and with millions of records being added daily, we provide both real-time as well as historic domain data. Along with the most comprehensive data, we also have a world-class API system to ensure easy access to all the data you need by integrating it with your business processes. Various products & services from WhoisXmlApi help professionals get data specific to their business needs. To further simplify the needs of various industries we also provide industry specific Data Solution Packages. Keeping our users and their needs in mind, our latest product aims to re-define domain research. Presenting Domain Research Suite (DRS), a web-app that provides a single platform to access, monitor and analyze domain data. Get an in-depth picture of domains with our various Search Tools along with daily alerts to stay up-to-date on domain-related activities with our Monitor Tools. We have created a single place for our users to access domain data and use this data without spending too much of their time & effort. Whether you are investigating cyber-crime, protecting your brand from infringements, tracking online activities of individuals or companies, keeping an eye on specific terms to find out registration trends or just keeping a tab on domains for investments, DRS is your one-stop shop for researching and staying abreast on all kinds of domain activities. Get the most real-time registration details, also known as the Whois Record, of a domain name. Whois records include all the key data points of a domain including registrant name, registrar name, organization, e-mail address, registration address, registrar information, creation date, expiration date, updated date, domain availability, domain age, and much more for a domain. This data is provided in a well-parsed format for easily assimilating the information. Find all the domain names corresponding to a particular ‘Search term’ such as a person or company’s name, phone number, email address or any other Registration detail found in a Whois record. This can be very helpful in finding connections between various domains, individuals, and organizations. Get the most accurate and real-time Domain Availability checker and find out if a domain is available to be registered or not. Get parsed Whois Records for a domain list of your choice without the hassle of sending a Whois query request for each domain name. Upload a .CSV file containing the domain names and access Whois records for the entire list at your convenience. Keep track on domains by getting alerts for any changes made in its Whois Database. For your monitored domains get details of any changes that occur in the Updated date, Created Date, Expiration Date, Registrant Info, Registrar Info, Domain Status, or any other information in Whois record. Monitor exact matches, variations and common misspellings of your brand name & trademarks to safeguard your brand online. You can also monitor keywords of your competition to track their domain activities. Get alerts when a newly registered and/ or recently expired domain is discovered with keywords you have added. Monitor all newly registered, deleted, or modified domains registered by specific individual/ company names. Get alerts when your monitored names register new domains, updates their existing domain record information or any of their domain names expire. DRS is a great tool for professionals as well as novice users alike. You do no need to configure, set up separate systems or software to access domain data anymore. All you need to do is register with WhoisXmlApi and you can start with our Free Plan today. 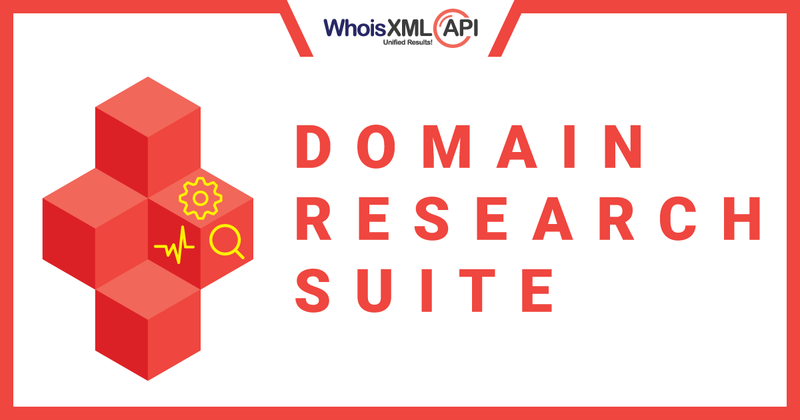 Enhance your domain research and always stay a step ahead with Domain research Suite.